Life in the country side has its own quaint charm. A weaver bird raises alarm as our cat comes home after wandering around in the neighbourhood. I wonder at the agility of the tiny bird who has been feeding her fledglings with worms and moths whole day almost incessantly. The fledglings peep out stealthily and curiously at the world outside which is so different from their cozy nest- The monsoons have been sluggish but occasional downpour keeps the weather pleasant, turning the grass green and supporting a whole lot of ecosystem. 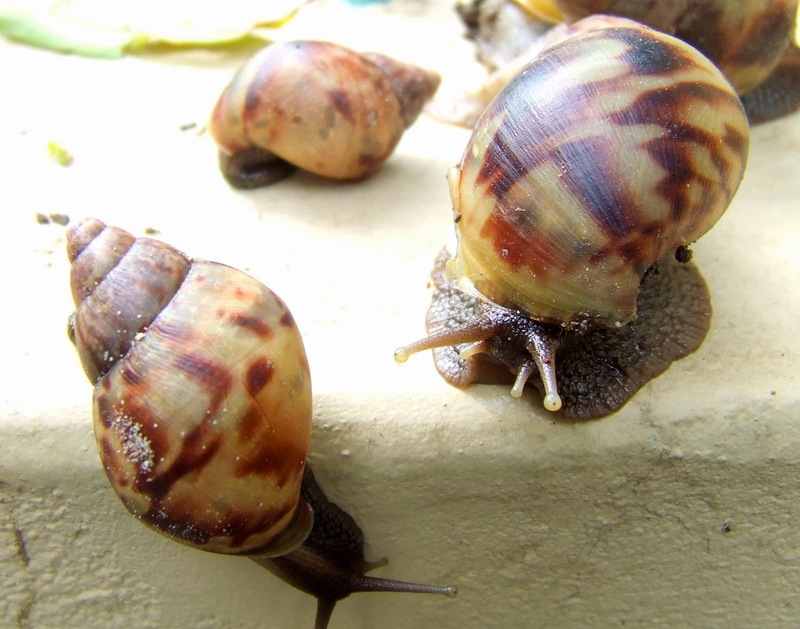 Tiny insects, strange worms, giant snails make their annual appearance, breeding and flourishing and completing their life cycle. Every seed that has managed to reach the soil has sprouted into a tiny plant…..a multitude of plants of varied species grow in our backyard providing feeding ground for the grasshopper nymphs and tiny caterpillars. How intricate and beautiful is the web of life! My son, hitherto a non-fussy eater, is beginning to develop strong food preferences. In his transitional phase from infancy to boyhood, he now prefers to eat on his own and has food choices which he never compromises with. Last week I baked a coconut cake. I had a lot of desiccated coconut at home. I had to use it before it turned rancid. The cake turned out to be quite a surprise. 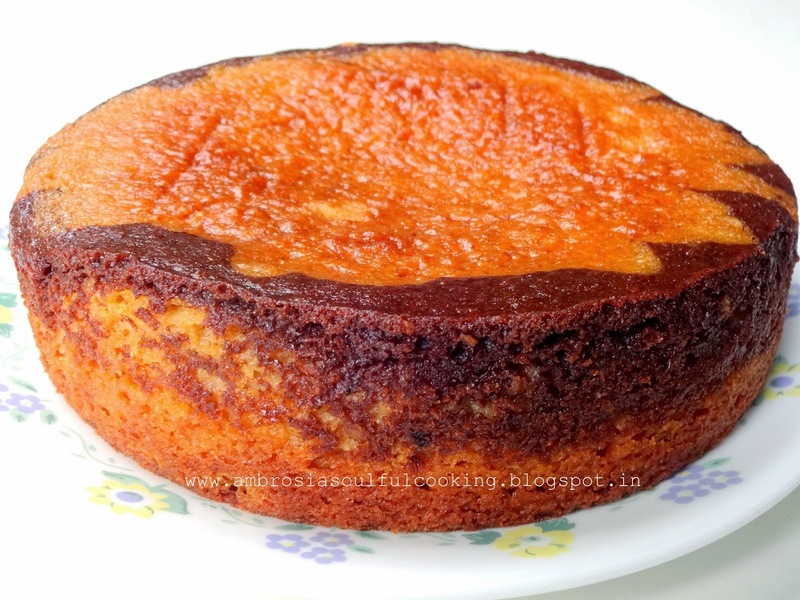 The combination of chocolate and coconut made it really special also the fact that it is my own recipe gave me immense happiness. My son approved it and had a big slice much to my exhilaration. Preheat oven to 200 degrees C. Line the bottom and sides of one 6 inch round cake pan. Beat yogurt till smooth. Add sugar. Leave till sugar dissolves. Whisk together whole wheat flour and desiccated coconut. Mix 1 tablespoon cocoa powder with 1 tablespoon warm water. Mix well so that there are no lumps. Add more water if it is too dry. Add baking soda and baking powder to yogurt. Mix and leave for 3 minutes. It will start foaming. Add olive oil. Add flour mix to yogurt mix and stir gently till you get a lump free smooth batter. Remove three ladles of this batter and add cocoa to it. Spoon the batters into the prepared pan. Add half of the plain batter. Now add chocolate batter followed by adding the remaining plain batter. Bake at 200 degrees C for 12 minutes. Reduce the temperature to 180 degrees C and bake for another 45 to 50 minutes till the top turns brown and a toothpick inserted in the center comes out clean. Tent loosely with a foil if the top becomes too brown too soon. Turn off the heat, remove from the pan after 10 minutes. Cool in the rack. Melt chocolate in a double boiler. Add milk and butter. Beat till smooth. Pour over the cake. Refrigerate before slicing. Hello Seeta, Thank you so much for visiting my blog. I used dry desiccated coconut in the recipe. I must thank you for bringing this to my notice. I have mentioned this in my recipe too! 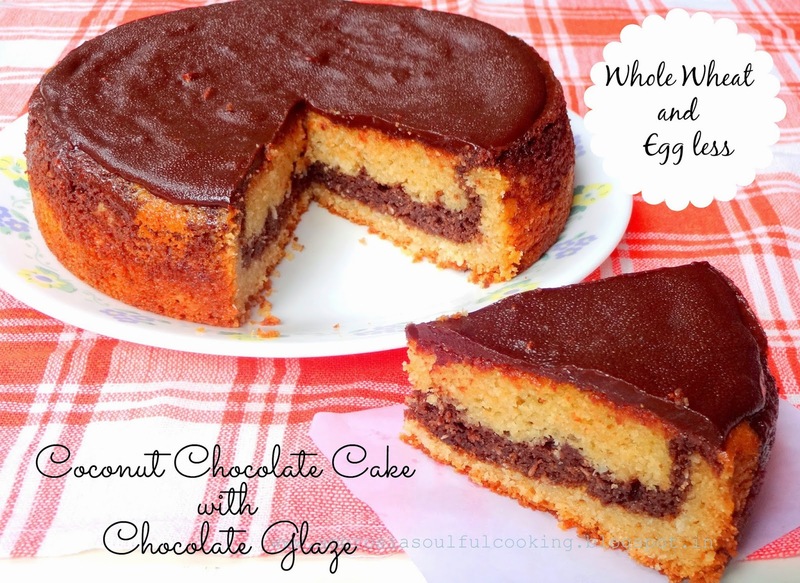 Though I am not a fan of coconut, I love that streak of chocolate in it and the fact this is a recipe that was experimented and came out so well. thankyou for sharing your recipes but I think I enjoy reading about your country life more! Yes, small towns have their own charm and pull, and I am so glad you are sharing your daily experiences with everyone. A query: is the wholewheat flour atta flour that is used in making chapaties? My daughter-in-law is a vegetarian and this site is really what we need to try out new recipes. Prettiness!! 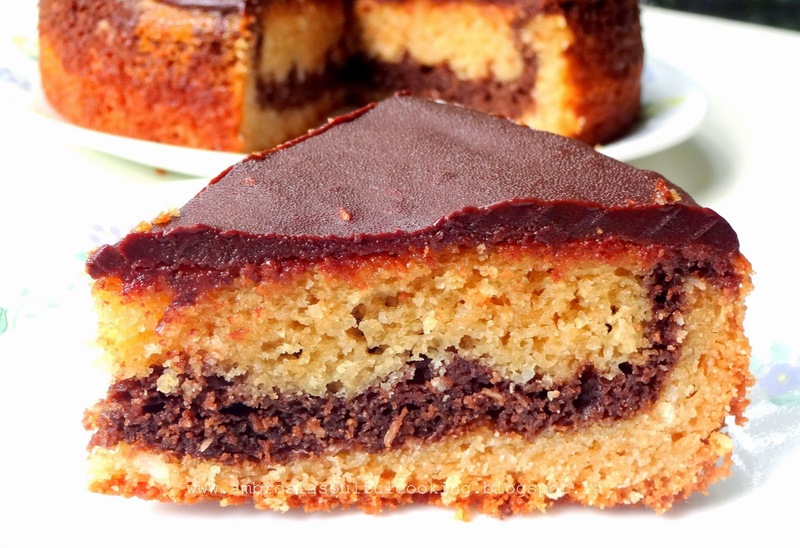 Love the pretty streaks of white and brown in this cake. So different from the usual zebra cake. I guess its time for me to use coconut in a cake! Sure it must be yum. Hello Mrs G Singh, My countryside life is very simple and very humble. I am so happy that you love reading about it. Yes, whole wheat flour is Atta. The coarser the better. We are all shocked and grieved about the MH-17 tragedy and earnestly pray that this is never repeated. We have been watching TV and wonder why it happened? I guess some doctors and research team doing some great work on AIDS were on board. This is a huge setback. Hello! Belated Happy Birthday to your son. I am trying to figure out what could have gone wrong with the cake. 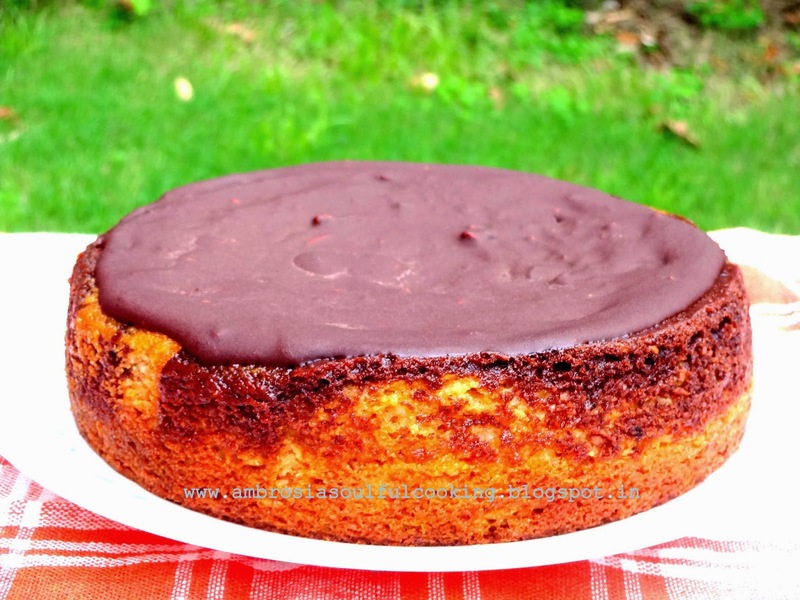 Did you bake the cake exactly at the tempetarures mentioned in the recipe? Was your curd too thin. I used store bought curd which was pretty thick. Was the batter runny? I remember that my batter was thick. I used a spoon to put it in the baking pan. Do let me know your feed back on this. Can we use lemon juice instead of bakind sida? Hello Nitin, Nitin I am not too sure if you can use lemon juice in place of soda. Soda is a leavening agent. You will have to use it. Yes. Brown sugar is a healthier option. Happy Baking! Yes, you can use all-purpose flour. Happy Baking!